The crunch of the taco shell with the salad and salmon in this recipe would work really well. A lighter alternative to the usual taco mix. 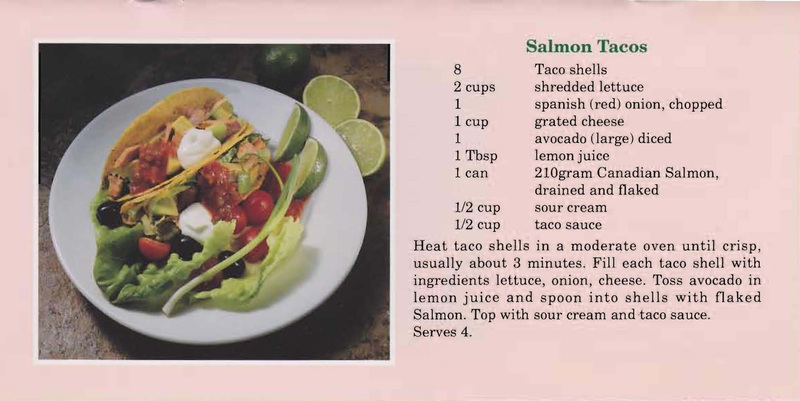 This entry was posted in All Recipes, Seafood, Uncategorized and tagged 1980s. salmon tacos, avocado, cheese, lettuce, red onion, salmon, sour cream, taco sauce, taco shells by bebsrecipes. Bookmark the permalink.